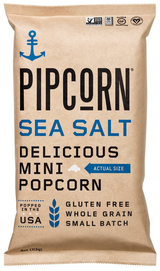 Sea Salt Pipcorn is simple yet oh so delicious. We season this one with, you guessed it, sea salt! The simple combination of sea salt and olive oil is not to be messed with.